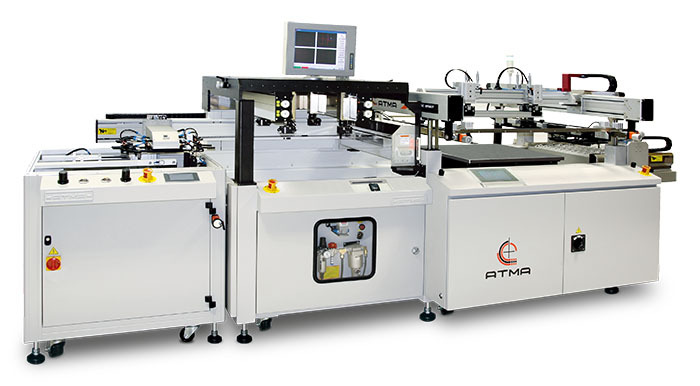 Precision fully automatic screen printing machine to meet highest demands, with 4-post system, CCD-camera system, movable print table with automatic feeder and outlet take-off device to produce high-quality prints on flat thin film materials such as blood glucose strips, flexible printed circuit boards, electrical components/semiconductor, EL panels, diffusive panels, sensors, and much more. The material is picked up with automatic (stacking) feeder and position on print table. The material is removed from print table with outlet take-off device onto delivery transport conveyor to drying/curing system. Innovative version 7 four post high precision screen printer with shuttle table and CCD automatic registering system offer high accuracy of registration, perfect functions increase working ability. Advanced structure design, light but strong and rigid, equipped with top class transmission units, plus high precision guiding registering system. Runs smooth, fast, silent, and with high accuracy. Digitalized operating functions, parameters setting, plus 100 sets of memories for storing production parameter, decrease the time of machine setting, and increase production ability. High level PLC+IPC(industrial personal computer) for integrating control system, color human-machine interface + color display, provide multi functions and parameters setting for in time operating/detecting, the convenience operations satisfy people’s requirements of digitalized, standardized and humanized operation. Installed automated debug system,safety reset function,safety guard shield,emergency stop pusth button, Indicator banks Optimum...etc for safety guarding. Working table size(DxW) 750mm x 750mm 29½" x 29½"
Vacuum Area 600mm x 600mm 23⅝" x 23⅝"
Max. Printing Area 600mm x 600mm 23⅝" x 23⅝"
Min. Printing Area 300mm x 300mm 11¾" x 11¾"
Substrate thickness 0.1mm - 1mm 0.0039" - 0.039"
CCD capturing range(mm) X±125mm - 300mm, Y± 125mm - 300mm X±4⅞" - 11¾", Y±4⅞" - 11¾"
CCD visual field(ring 20mm) 10mm x 8mm ⅜" x ¼"
Max.O/D frame size (DxW) 110cm x 110cm 43¼" x 43¼"
Min. O/D frame size 900mm x 900mm 35½" x 35½"
Screen height at cleaning level 340mm 13⅜"
Print head speed 20-625mm ¾-24⅝"
Max. Substrate Size 600mm x 600mm 23⅝" x 23⅝"
Min. substrate size 300mm x 300mm 11¾" x 11¾"
Total stacking height 360mm 14⅛"
Dimension(WxDxH) 430cm x 170cm x 180cm 169¼" x 66⅞" x 70⅞"